Many residents and visitors will have seen the new carpet bedding flower display at the beach which was planted in mid-June. The design is taken from the uniform button of the Royal Warwickshire Regiment and marks the centenary of a tragedy that occurred in August 1917 when 9 young men of the Royal Warwickshire Regiment drowned. The men belonged to a group of around 600 soldiers who were on a training march. It was a hot day and they were given permission to cool off in the sea but most could barely swim and some had never seen the sea. None were aware of the dangers of the ebb tide and a number of the men quickly got into difficulties. Others went to their aid and also foundered. Lieutenant Kenneth Brown organised human chains to attempt a rescue and seven soldiers were saved while eight were swept out to sea. Lt Brown lost his footing and, despite efforts to hold on to him, he too was swept out to sea and drowned. Most of the bodies were returned to their relatives in the Midlands but the body of Lt Brown, which was recovered from the sea several days later, is buried in Horton Churchyard. To find out more click here. A dedication service was held at the beach beside the Dave Stephens Centre on Thursday 24 August 2017 when a commemorative plaque was unveiled. Please click here to view the images of the Service. The Commanding Officer of HMS Blyth, Lieutenant Commander Matt Sykes and six members of the ship’s company travelled to the town of Blyth on Thursday 10 September 2015 to meet the Mayor of Blyth, Councillor Margaret Parker, and guests to take part in a special memorial service. The service was held in recognition of the important part that the town played in naval history during both world wars and celebrated the close affiliation between HMS Blyth and the town. The ship last visited Blyth in 2010. Lt Cdr Sykes and the ship’s company also visited The Dales School, a special needs primary school with whom they have had a close affiliation since the ship was commissioned. Lt Cdr Sykes said: “I was delighted to be able to bring some of my crew to Blyth and to continue building on the previously established affiliations with both the Town Council and The Dales School. “The memorial service is a great opportunity to remember the important role that Blyth has played in naval history playing a major part in shipbuilding and hosting naval warships in both world wars. 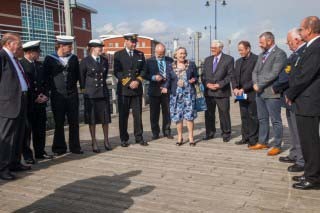 The Mayor, Councillor Margaret Parker, thanked the ships company for attending and commented that “The Town Council is delighted to renew our connection with HMS Blyth. We have followed their vital work around the world and are grateful for their service. Blyth is proud of its associations with the Royal Navy and HMS Blyth and looks forward to welcoming the ship and the crew in the future”.